Michigan Theatre’s screening of Spirited Away was met with a delightfully long line outside the theatre, people willingingly shivering in the cold, anticipating the much-loved Ghibli classic. I have to admit before I go any deeper into this review that this was my first time watching Spirited Away– or any Ghibli movie, for that matter. It was such a treat to witness the spectacle of animation and the immersive fantasia of Chihiro’s journey into the spirit world. I walked out of the theatre with my head filled and spinning with colors, the trembling of leaves, the delicate swaddling of stars in the sky, the ordinary magic of life. I want to watch every Ghibli movie now and be muse to the enchantments it casts on the viewer– and, honestly, I want to watch it on the big screen. I’m so glad that the Center for Japanese Studies is extending their screening series called the “Icons of Anime” to show even more animated Japanese classics in the Michigan Theatre. Spirited Away tells the story of ten-year-old Chihiro’s journey into a terrifying and fantastical adventure into some kind of spirit world. Her father stops in front of a derelict amusement park, and, despite Chihiro’s insistent disapproval, her parents enter the park and begin eating the food at the vending station. As nighttime descends, spirits emerge in the world around Chihiro. She desperately tries to go back to her parents only to find out, in one truly terrifying moment, that they’ve been turned into pigs. Chihiro must befriend the spirits in the theme park and work there in order to buy her and her parents their freedom from being trapped. Chihiro meets little spider-like coal-carrying creatures, an eight-legged man who mans the production of the resort, some friendly guiders, and a scary woman with a large, wrinkly face who owns the resort by night and stalks its grounds as a hawk by day. Chihiro also meets Hero who helps her– and whose fate it ultimately entangled with her own. The plot of the movie is gripping in the beginning of the movie. It hits a bit of a dip in the middle and meanders a bit before picking back up by the conclusion. In the end, however, I’m not sure that the plot of the movie itself as engaging as the cinematic experience of it. There were plot points that seemed lazily patched-up at the end of the movie and the protagonist didn’t develop a great deal throughout the movie (perhaps she gained strength and bravery, but this wasn’t of real importance). The beauty and immersive animated experience of the movie overcomes its narrative weaknesses– but still, I can’t help but believe that the movie as a whole could have been strengthened by a better focus on plot structure and character development. Ultimately, however, Spirited Away was a truly enjoyable movie experience– magical, unique, and transportive, with the same power and childlike wonder as a Disney movie, but its magic works differently. I look forward to watching many more Ghibli movies. “Rachel” is a documentary piecing together the nuances and injustices of the death of an American activist in Palestine named Rachel Corrie. Twenty-four year-old Rachel was on a trip to Palestine as a trained activist with a group of other activists in their twenties. At this time in the early two-thousands, the tension in the Israeli-Palestinian conflict was gaining a new wave of intensity with the beginning of the Second Intifada. Rachel and her team were helping Palestinian civilians whose homes were most in danger of being destroyed by Israeli occupation. In an attempt to prevent the destruction of one such house, Rachel stood in front of a bulldozer to obstruct their moving forward; however, the driver of the bulldozer claimed to not see her– though the eye-witnesses to the case speculate otherwise– and ran her over; in a matter of seconds, her body was mangled beneath a mound of dirt and crushed by the metal. Rachel died. Though there seems to be evidence that there was criminal intent by the driver of the bulldozer, the case gained a momentary spark of media attention, only to die down with the injustice of Rachel’s death never to receive due legal attention. This documentary is an exploration of the testimonies of the activists who she travelled with, Israeli soldiers, and many others who were knew her or were related to her death. The simple, straightforward style of the documentary makes it easy to follow all the intricacies of the evidence presented: testimonies of colleagues and family members, on-site videos and photographs, Rachel’s diary entries. By the end of the film, I felt fully educated about the facts of Rachel’s death– and the thing about the documentary is that it doesn’t ever once say outright that what happened to Rachel unfair or unjust. It just keeps building evidence, slowly but surely, until you’re painfully aware of all the wrong that was done to her. The driver of the bulldozer claimed that he couldn’t see her over the mound of dirt while her team says the mound was hardly a few feet tall; the US embassy failed to send an American to oversee her autopsy even though her parents requested it, probably because the US didn’t want to entangle itself politically; the general of the Israeli forces claimed that there was not enough eyewitness testimony or video evidence, only two opposing viewpoints, which seemed essentially inconclusive. No real legal action could be taken to prove that the driver of the bulldozer had criminal intent. The documentary works to show that there was a system of injustice present that lead to Rachel’s death. The documentary illuminates the cracks of legality and excuses that Rachel slipped between. The documentary itself works as a bulwark against injustice. The film is modest in its cinematography and aesthetics, but it is large in its meaning and purpose. Rachel was one American activist whose life and injustice has been filmed and commemorated, but it’s a powerful reminder that there are people suffering from crises around the world who won’t get any attention. But there is a small line of hope, perhaps– as we keep talking about these injustices, as long as we make art and conversation about it– we can create a bulwark against it. The esteemed poet Natasha Tretheway will be reading at the Hopwood Awards Ceremony tomorrow Jan 30 from 6-8:30 PM in the Rackham Auditorium. Her work has won many accolades from the Pulitzer Prize to longlistings for the National Book Award. Tretheway seamlessly merges traditional and non-conventional styles in her poetry and powerfully comments on history as a contemporary poet. The even will also announce and celebrate its student writers who won the 2019 Hopwood Awards. I look forward to a delightful evening of literature with the creative writing community on campus. This event is free. I’m thrilled to be attending my first Studio Ghibli movie on the big screen! Spirited Away will be screened on Wednesday, Jan 23 at 7 p.m. in the Michigan Theatre. It is part of a larger film series, Icons of Anime, curated by the Center for Japanese Studies. Directed by the acclaimed Japanese director Hayao Miyazaki, the movie follows ten-year-old Chihiro as her family stumbles upon a supernatural theme park. The movie has gorgeous, magical animations and is a captivating fantasy. Mary Poppins Returns hit theatres in December 2018, and was received with mixed reviews– some loved the new spectacular addition to the classic Mary Poppins film starring Julie Andrews; others found it exhausting and drab in terms of plot, characters, and music. I find my own opinion lodged somewhere between the two; I didn’t love the movie, but I will defend its integrity and originality. The movie takes place a generation after where the first movie left off. Michael and Jane Banks, the children who Mary Poppins comes to nanny, are all grown up now. Jane is an activist fighting for union workers’ rights, and Michael is an artist and teller with three children who recently lost their mother– and it seems like that they’re all about to lose something else– their house. Amidst this financial turmoil, Mary Poppins materializes to help the Banks children– all of them– go on a magical adventure to revitalize their sense of wonder and joy. Emily Blunt’s rendition of Mary Poppins is, well, blunt. This new Mary Poppins, reeled in through a kite with not a single hair out of place despite emerging from the eye of a raging storm, with perfectly poised little kitty heels bent at an artful angle, with her curt responses and matter-of-fact commandeering of the Banks children– she’s not as cheery and la-di-da as Julie Andrews’ Mary Poppins. This new one’s feisty. She’s got attitude. She means business. This new Mary Poppins rolls her eyes and bustles around and smiles less but manages to do more. Her magic is controlled and precise, bestowing the children with their own sense of agency rather than spoiling them with her treats. Emily Blunt’s interpretation of Mary Poppins is slightly spicier than it is sweet– and I love it for that. I’ll defend this movie against musical theatre purists that argue that Emily Blunt is not as good as Julie Andrews. They’ve both made the role their own in fun and inventive ways. That being said, however, in all honesty, my reaction to this movie was quite ordinary. I didn’t love it; I didn’t hate it. The plot of the Banks children trying to keep their house wasn’t the most engaging, even if Colin Firth was the one playing the evil banker. I didn’t find myself humming the tunes to the new songs as I walked out of the theatre. They just weren’t as catchy or extraordinary as they’d been hyped up to be. And, most importantly, the movie didn’t light up that spark of wonder and joy that Disney movies usually do; the nostalgic, gooey, fuzzy feeling spreading through my stomach– that life can be seen through a rose-colored lens– this movie just didn’t strike that emotional cord for me. It did have its ups, though. In a song called A Cover Is Not The Book (possibly my favorite part of the whole movie– it’s really fun and whimsical), Jack and Mary Poppins perform with animated characters under the dazzling lights of a circus tent, and in the classic Hamilton style, we get some of Lin Manuel-Miranda’s crisp rhymes and fast-paced rap-style rhythms. There’s a song where the Banks children’s bathtub transports them to an oceanic adventure, swimming with whales and dolphins under an infinite blue sky and tufty white clouds. There’s the subtle romance between Jack and Jane, and though it’s painfully underdeveloped, it’s cute to watch. But still– I can’t really say that any of this adds up to a hugely substantial and magical movie experience. It’s a fun movie, and obviously part of a larger American musical cultural phenomenon, but in isolation, it seems enjoyably ordinary to me. The last animated film I fell in love with was Zootopia from a couple years ago, but there’s no doubt that Into the Spider-Verse has indefinitely exceeded it. The animation is utterly breathtaking and alive, capturing all the inter-dimensionality of the storyline and the true vivacity of New York City. The movie is also written exceptionally well with an engaging and relatable main character, Miles Morales, a Afro-Latino thirteen-year-old growing up in Brooklyn. Overall, the movie is a powerful addition to the Spiderman canon with a positive lead character who is a person of color– and, more than anything, all this in combination with its stunning animation and art style make it one of the best animated movies I’ve ever seen. Into the Spider-Verse follows the story of Miles Morales, a nerdy, artistic teanager in boarding school in New York City. His African-American father is a cop, his mother Puerto-Rican, though Miles is closest to his Uncle Aaron. On a night when Miles and his uncle are spray-painting a tunnel in the Subways, Miles gets bitten by a radioactive spider, giving him the powers of Spiderman. After witnessing the death of Peter Parker, Miles realizes that there are many other spider-people just like him who have similar powers– and they must all team up to close a dangerous breach in the fabric of their spacetime dimensions. The character for Miles Morales was created in 2011 by writer Brian Michael Bendis and comic artist Sara Pichelli, drawing inspiration from President Barack Obama. What I loved about this movie (and what a lot of people seem to want from Spiderman) is how it added a new personality and perspective to Spiderman. Miles seems like a very authentic and relatable kid going through the ups and downs of growing up, which is all exacerbated by his newfound spider powers. His ascent to heroism is believable and admirable, as he struggles and fights to fit into the burden and responsibility of being a superhero. Miles isn’t a flashy, flaunting superhero– he is genuine, down-to-earth, and, even when he’s out saving the world, the audience knows that the guy behind the mask is just a kid from Brooklyn who loves art and is still finding his place. He seems to be one of the most human superheros in the universe, and I love that. The characters and relationships in this movie are written exceptionally well– it hits a sweet spot between funny, touching, and inspirational. I loved laughing at the jokes as much as I loved watching the conflict escalate. Miles wears a cheap Spiderman costume because he doesn’t have his own yet. The best part about the movie, however, the part that still keeps me coming back to it, is the visual spectacle. The movie is bursting with color, liveliness, and utterly perfect animation. The style is quite realistic with a comic twist, almost as if the pages of a comic book had just come to life, dancing with color and movement. 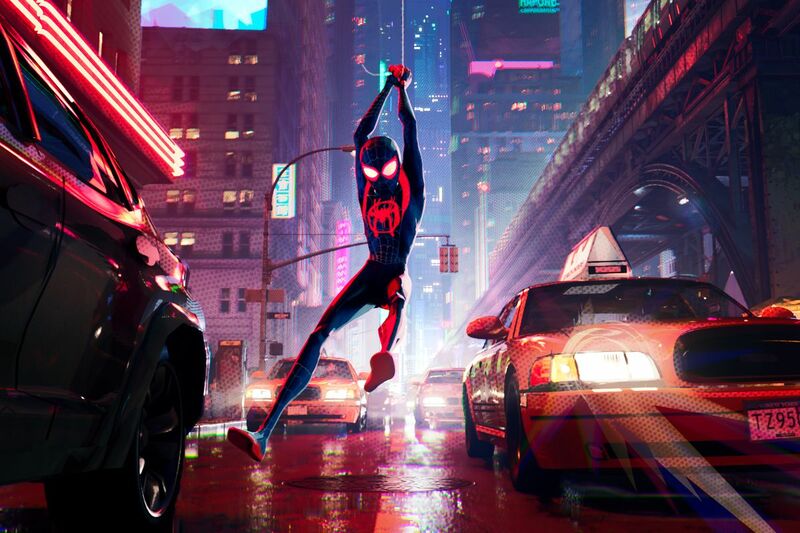 The accompanying soundtrack features artists like Nicki Minaj, Lil Wayne, and Post Malone, and it is fresh, original, and fits the movie so well– just like what Miles Morales would listen to. The movie is an absolute feast for the eyes and ears. If you get the chance, I highly recommend this movie. At the very least, it’s highly entertaining– at the most, you will have come out of the theater with a thrilling visual experience and met the best spiderman yet.